National Guard soldiers train with a Stinger anti-aircraft missile. HUNTSVILLE, ALA.: Less than six months after its official rollout, the Army’s new concept of future warfare has gotten traction with all four armed services. In brief, Multi-Domain Battleenvisions the military — everything from submarines to satellites, tanks to jets, destroyers to drones, grunts to hackers — working together to overwhelm the enemy with attacks from all domains: land, sea, air, space, cyberspace and the electromagnetic spectrum. While that vision is years from reality, it’s already spurred inter-service cooperation on how to make it real. Defense Secretary Jim Mattis at his first meeting at the Pentagon. Robert Work is at the right. 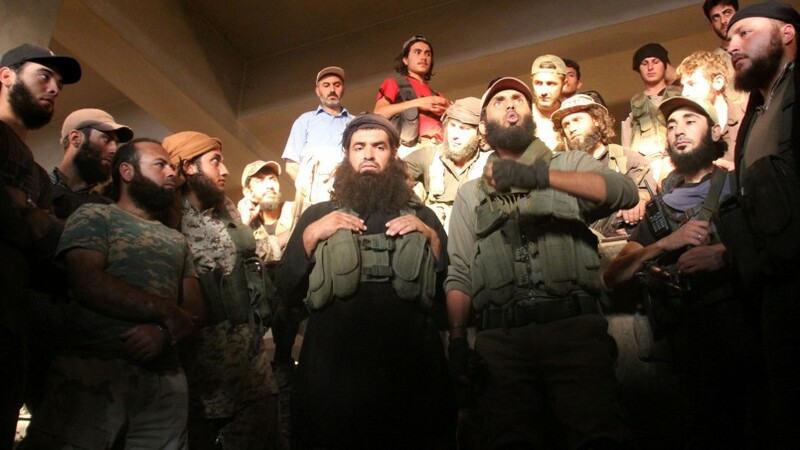 Though al Qaeda in Syria has emerged as the most effective rebel faction in Syria's civil war, it will have trouble drawing new allies to its side as other rebel groups and their foreign backers grow wary of its expanding influence. Al Qaeda in Syria's efforts to keep a low profile will become even more difficult now that the group has taken on a central role in the fight. Opposition to the group — from the rebel camp, the loyalists, and foreign allies on both sides — will continue to mount. Al Qaeda is making steady gains in Syria. 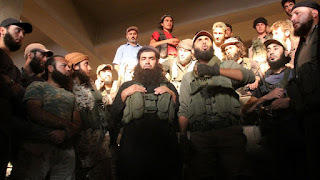 From its beginnings as a shadowy insurgent group to its evolution as a powerful military force in the civil war, the group's Syrian outfit has slowly but surely increased its influence in the country. And its patience is paying off. In January, al Qaeda's affiliate in northern Syria, Jabhat Fatah al-Sham (formerly known as Jabhat al-Nusra) merged with several other rebel groups in the area to become Hayat Tahrir al-Sham. Today, al Qaeda is eclipsing the Islamic State as the most dangerous extremist organization in the region. But its success may well be its undoing. The more power China has accumulated, the greater has been its difficulty in gaining genuine allies, underscoring that leadership demands more than brute might. Contrast this with the strong network of allies and partners that the United States maintains in the Asia-Pacific region and elsewhere. The withering of China’s special relationship with North Korea, once its vassal, illustrates Beijing’s dilemma. The rapid deterioration in Beijing’s ties with North Korea — which boasts good reserves of iron ore, coal, magnesite, graphite, copper, zinc and other minerals — is sure to increase China’s sense of being alone. Indeed, when Pyongyang recently accused China of “mean behavior” and “dancing to America’s tune,” it underscored not only its ruptured relationship with its powerful neighbor but also the fact that Beijing is now left with just one real ally, Pakistan. Quasi-failed Pakistan, although a useful tool for Beijing to contain India, is a dubious ally for China in the larger context. China's military needs to promote technological innovation as the "key" to its upgrading and modernization, President Xi Jinping told military delegates to the annual meeting of parliament. Xi is overseeing a sweeping modernization of the country's armed forces, the largest in the world, including stealth jet, anti-satellite missiles and advanced submarines, seeking to project power far from its shores. Science and technology innovation is the "key to military upgrading", Xi told military delegates, state news agency Xinhua said late on Sunday. "Efforts should be made to provide greater science and technology support for the People's Liberation Army," the report paraphrased Xi as saying. "We must have a greater sense of urgency to push for science and technology innovation and advancement with greater determination and efforts." There needs to be improved military and civilian cooperation in training high-quality military personnel, he added. After political consolidation, China is ready to begin a broader implementation of structural reforms. That is vital to double per capita income over the interval 2010-20. Despite its name and origin, the China Association for Promoting Democracy (CAPD), like the country’s seven other officially sanctioned political parties, has long pledged its allegiance and loyalty to the ruling Communist Party. It is rarely visible except on important occasions when its leaders and those of the other parties are trotted out to burnish the Communist Party’s policies and decisions in their advisory capacities. So some mainland journalists were in for a surprise on March 1 when they were invited to hear the proposals the CAPD had prepared to submit to the annual session of the Chinese People’s Political Consultative Conference (CPPCC) which began two days later. Luo Fuhe, a vice-chairman of the CPPCC and executive vice-chairman of the CAPD, told journalists that his party’s first proposal was to urge the authorities to ease internet restrictions to enable faster access to overseas academic websites and search engines. At a time when energy market headlines focus mainly on OPEC cuts, observers may be forgiven for concluding that a supply crunch and higher prices are imminent. On the contrary, there is still too much oil in global markets. In this context, OPEC production cuts (which notably fall short of the original target envisaged by the organization) appear to serve mainly as a psychological support to oil prices. Analyzing trends from my proprietary database of more than 1,200 global oilfields helped me to make a bold prediction in 2012 regarding a coming oil supply boom. In January, my similar field-by-field analysis indicated that world oil production capacity and actual production were still growing—while prospects for demand growth were not sufficiently high to absorb the excess supply. In particular, actual oil production (which includes crude oil and other liquids such as condensates, NGLs, and more according to the standard definition used by most statistics) was almost 99.5 million barrels per day (mbd)—leaving a voluntary and involuntary spare capacity (the result of local civil wars and other geopolitical factors) of more than 4 mbd. This surprising level of oil availability is a consequence of the impressive acceleration of world oil production that began between September and October 2016 and culminated in December 2016 and the early weeks of January 2017. When representatives from the Trump administration travelled to Europe last month, they made sure to stay on message. Secretary of Defense James Mattis and Vice President Mike Pence underlined that they expect Europeans to quickly spend more on defense. Germany and its peers were asked to make concrete proposals on how to reach the NATO target of spending 2 percent of the national GDP on defense. The real transformation for Germany’s defense policy is, however, not the planned increase of defense spending, but its new pragmatism in pushing Europe towards cooperation on military matters. Germany was singled out as the main target of the U.S. burden-sharing demands. Even though Berlin increased its defense budget by 8 percent in 2017 and is allocating 1.22 percent of its GDP to its military, the biggest European economy still falls far behind the alliance’s defense spending goals. Chancellor Angela Merkel and her defense minister Ursula von der Leyen were quick to confirm that Germany will do its utmost to fulfill the 2 percent commitment. WASHINGTON – Today, Rep. Mike Rogers (R-AL), Chairman of the House Armed Services Subcommittee on Strategic Forces, made the following remarks, as prepared for delivery, on the Subcommittee’s hearing titled “Nuclear Deterrence—the Defense Science Board’s Perspective.” For testimony and to watch the hearing click here. I want to thank our witnesses for being here today and for your service to the public. Our witnesses are all experts who have spent their careers in fields related to nuclear deterrence. They are appearing today in their capacities as Members of the Defense Science Board, but all have long and distinguished histories in the topic of our hearing. In December 2016, in the waning days of the Obama Administration, the Defense Science Board completed a report titled ‘Seven Defense Priorities for the New Administration.’ It made recommendations to the new Trump Administration on key issues in the world of defense. KEVIN BOOK: Good morning, and hi and welcome. My name is Kevin Book, and I’m a senior associate here at the Center for Strategic and International Studies. And I also wear a lot of hats, as someone with my haircut might, and I’m managing director at ClearView Energy Partners as well. And we’re going to get started here in just a moment. I wanted to welcome you to this – second unveiling? You can’t really unveil, I guess, a second time. The Washington debut of the Oil Market Report with Keisuke Sadamori, back again to do I think what will be a very interesting discussion. We’ll go through slides. We’ll have a discussion. I will take the privilege of asking a few questions beforehand. And then hopefully we’ll look to a lot of old friends and skilled oil mavens in the crowd. Apparently they followed you up here from Houston. All the intelligentsia are here now for you. For those who don’t have the benefit of knowing Keisuke Sadamori, he is the director of energy, markets and security at the IEA. If you – if you saw him last year or you’ve seen him speak in the past, you know that he has at his command a wealth of knowledge, not just in terms of what’s in the report but how the report was made. He has a command of statistics and figures, and more importantly trends and observations, and we’re very delighted to have him here to take us through what the IEA has learned. Are Our Strategic Models Flawed? Why is the multi-domain battle concept different? As the military is looking to adopt cross-domain or multi-domain approaches to warfighting, why can’t they apply similar models taken from the integration of air power into doctrine or other similar advancements? Why is the multi-domain concept different? This was a question one of the critical players in helping to architect the Army’s new multi-domain concept addressed today at the AUSA-hosted Global Force Symposium in Huntsville, AL. In the past, Gen. David Perkins, commander of Army Training and Doctrine Command, quipped, problems were addressed in isolation. Problems would be broken down by their war-fighting functions and their respective domains, he said. Upon developing a solution, the force would retro fit these siloed solutions together given they were not integrated, but rather federated. This series of federated solutions, Perkins said, created problems for challenges that arise under the guise of multi-domain battle. Contrary to the traditional Israeli historiography that lays all the credit for the formation of the Jewish state at the feet of David Ben Gurion and the Jewish Agency, Hoffman in his book argues that Israel might not have been possible without the efforts of some of its anonymous soldiers. Does terrorism work? That is the provocative question with which Bruce Hoffman begins his book. Although politicians such as Ian Smith, Ronald Reagan, and Margaret Thatcher and scholars such as Thomas Schelling, Caleb Carr, and Max Abrahms tend to answer in the negative, such a widespread belief in its ineffectiveness is not shared by terrorists themselves. Most terrorist groups have failed in achieving their political aims but the few success stories - Ireland (1922), Israel (1948), Cyprus (1960), and Algeria (1962) - mean that the phenomenon deserves closer scrutiny. No one doubts the ability of terrorism to spark off greater conflagrations - the assassination of Archduke Franz Ferdinand, the attack on the World Trade Centre in New York on September 11, 2001 - but some terrorist groups such as the Provisional Irish Republican Army and Hezbollah have achieved a modicum of success through their violent antecedents. Anonymous Soldiers: The Struggle for Israel, 1917-1947 analyses one of the success stories, Israel, as the title suggests, to understand the reasons for its success. Harris Corp. has unveiled its Falcon III RF-300H, which the company bills as the world’s smallest, lightest and fastest wideband manpack radio. The RF-300H "replaces the US Type 1 AN/PRC-150(C) — delivering data up to 10 times faster in a package that is 20 percent smaller and lighter," according to a Harris news release. "The RF-300H is fully backwards compatible with the Harris Falcon II HF product line, with more than 100,000 radio units deployed worldwide. It provides a reliable alternative to satellite communications for beyond line-of-sight voice and data communications and also features either a commercial GPS or a Selective Availability Anti-Spoofing Module (SAASM)." “The new Harris RF-300H manpack radio provides more security and enhanced wideband HF than any other radio in the marketplace,” said Chris Young, president of Harris Communication Systems. The U.S. House of Representatives has floated what is titled the “Active Cyber Defense Certainty Act,” which basically allows companies experiencing a cyberattack to hack back! This essentially counters the “Computer Fraud and Abuse Act,” which bars companies and individuals from hacking into a computer system that is attacking them. The proposed legislation was floated March 3, 2017, and will surely get the attention of security professionals and organizations around the world. Those defending the bill compare this proposed piece of legislation to the right of self-defense in the physical world. Opponents are quick to point out that the difference is cyber anonymity. The tools and techniques that are commonly used to obscure those truly behind the attack have increased in number, sophistication and use. This increases the likelihood that the hack-back activities will be focused on unwilling intermediaries whose systems have been unknowingly hacked and those not really behind the attack. Some are concerned that this could easily cause an escalation of cyber hostilities. Clearly, this is a slippery slope with a number of negative effects. Without question, this is a must-watch issue for all those involved in cybersecurity on the national security side and within the private sector. Summary: Given the pace of progress in AI development, the expanding scope for its application, and the growing intensity of the current research effort suggests that it may not be too soon to revisit and revise the Asimov commands on computing. Many moons ago, in 1942, when intelligent computers began to figure in science fiction, Isaac Asimov laid down three rules for building robots: they should do no harm to humans either through action or inaction; must always obey human command; and be able to secure their own existence so long as this does not violate the first two rules. As computing power grows rapidly and begins to envelop many aspects of our life, there has been a growing concern that Asimov Rules, sensible as they are, may not be adequate for the 21st century. Scientists like Stephen Hawking and high tech entrepreneurs like Elon Musk have sounded alarm bells about super intelligent computers ‘going rogue’ and dominating if not destroying human civilization. Not everyone agrees that we are close to such a catastrophic moment. But given the pace of progress in AI development, the expanding scope for its application, and the growing intensity of the current research effort suggests that it may not be too soon to revisit and revise the Asimov commands on computing. This week, we have watched the perfect example of a country fighting the last war. The Trump administration has now devoted weeks of time, energy and political capital to rolling out its temporary travel ban against citizens of six Muslim-majority countries who, according to the libertarian Cato Institute, have not committed a single deadly terrorist attack in the United States over the last four decades. Meanwhile, the White House's response to a devastating barrage of WikiLeaks disclosures that will compromise American security for years was a general vow to prosecute leakers. The WikiLeaks revelations are designed to uncover and cripple American intelligence operations of any kind, against any foe, from Russia or China to the Islamic State or al-Qaeda. WikiLeaks claims to be devoted to exposing and undermining centralized power, and yet it has never revealed anything about the intelligence — or domestic policing — operations of the Russian and Chinese governments, both highly centralized dictatorships with extensive and advanced cyber-intelligence units. Indeed, WikiLeaks has chosen as its obsessive target the United States, which probably has more democratic oversight of its intelligence agencies than any other major power.